As stated previously, the introduction of turbines and their associated scour protection has the capacity to increase the abundance and diversity of both species and habitats. The level of increase depends on the type of scour protection deployed, with the three main materials - boulders, gravel and synthetic sea-fronds - being included in a study which aimed to quantify the amount of habitat area created. The need to deploy scour protection around the base of turbines depends on a number of factors, including seabed type, potential for seabed movement, and the design of the turbines themselves. Where used, as stated above, there are three main types of protection deployed, as illustrated in Figure 2. Figure 2a illustrates the general scale of boulder or gravel protection around the base of a wind farm, for relative scales compared to average turbine dimensions. Although actual dimensions vary with specific turbine makes and models, and deeper water will bring about new designs and technologies, in general, projects currently under construction, or well-advanced in the planning process are in waters up to around 30m. Projects entering the planning process now, such as some in Scottish Territorial Waters, or as part of the large Round 3 zones, are in waters of 50m or more. The majority of turbines installed globally to date follow the same design as illustrated in Figure 2, the monopile design, with a single pile driven or drilled into the seabed, with the tower, nacelle and blades fitted on top. This is the foundation design which was used in the calculations by Wilson and Elliott (2009), the results of which are discussed below. Fig. 2. a) Approximate extent of rock / gravel protection around the base of a monopile wind turbine foundation; and b) Polypropylene frond mats around a foundation. Both taken from Linley et al. (2007). From Figure 2b, it can also be seen that the synthetic frond mattresses can be relatively large in height, allowing plenty of shelter and protection for a wide variety of fish species. Wilson and Elliott (2009) assessed the level of habitat lost and gained through the installation of a 4m diameter turbine, with an area of scour protection extending 10m from the base of the turbine. The results of the calculations from this study are shown in Table 1. Table 1. Habitat loss / gain due to the installation of an offshore wind turbine and associated scour protection. For these calculations, a turbine foundation diameter of 4m was assumed, with 10m of scour protection extending from the edge of the foundation. For gravel, a mean diameter of 5cm was assumed, with a 2m diameter for boulders. From Table 1, it can be seen that for each turbine, there will be a gain in the surface area available for colonisation through the use of gravel or boulders as scour protection. For synthetic sea-fronds, although the values indicate a reduction in surface area, the change in habitats available should be noted. As offshore wind farms are generally located in relatively flat, biologically-sparse areas of seabed in order to reduce impacts on the seabed and associated organisms, the introduction of a sea grass type habitat will increase habitat diversity, thereby potentially still having ecological benefits for the area. Each of the main scour protection materials has the potential to attract a distinct biological community, based on the type of habitats it can create, e.g. the level of shelter provided, or the lower organisms which are initially attracted to the structure. Where gravel protection is deployed, the area will generally be inhabited by low numbers of robust polychaetes or bivalves, with occasional epibiota including echinoderms and crustaceans. According to the JNCC 2004/5 Comparative Tables, available through the JNCC website, other dominant species can include the parchment worm, which create extensive 'beds', within which can be found large populations of shrimps and small crab species, in turn providing food for species such as pipefish and seahorses, which are able to anchor themselves to the tubes by their tails (Anthoni, 2006). Pipefish and seahorses are also amongst the species most likely to be found where synthetic sea-fronds have been used as scour protection, which, from anecdotal and photographic evidence, most closely mimics a sea grass bed once semi-buried by accumulating sediment. 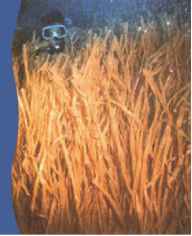 Sea grass beds are important habitats for fish, providing shelter from predation, nursery areas and refuges from larvae, as well as feeding grounds (Kopp et al., 2007). Gobies also make up a large component of the sea grass community, with densities within sea grass beds reaching up to four times those in surrounding non-grassed areas (Pihl et al., 2006). Of the three scour protection materials, boulder protection has perhaps the greatest potential to enhance populations of commercially-fished species. If well designed, then lobster, edible crab and velvet swimming crab may be attracted, as well as reef fish such as wrasse and conger eels (Hiscock et al., 2002), as the boulder protection will mimic rocky outcrops, which generally have higher levels of biodiversity and abundance than surrounding sandy seabed areas. Due to the commercial status of lobster, a number of studies have been undertaken into how populations may be impacted / influenced. For example, one study looking into the settlement patterns of juvenile lobsters found that no lobsters were recorded settling onto sandy areas of seabed, compared to 19 lobsters/m2 on large cobble and boulder covered areas (Linnane et al., 2000). Work focusing on the colonisation of wave power foundations (Jensen et al., 1994), suggested that the deployment of such structures into areas where lobster populations were habitat-limited could have the potential to enhance biomass production. It has been noted that shelter from predation may be a serious bottleneck for many species, lobster and crab included, therefore the deployment of wind and wave energy structures and associated boulder protection may increase production at a local scale (Langhamer and Wilhelmsson, 2009). A major argument for the capacity for habitat creation around offshore turbines is the increased level of habitat diversity which is brought about through the introduction of a new habitat, whether it be rocky outcrop, gravel bed or sea grass patch. Diversity of available habitats is important in bringing about diversity in the number of species able to colonise and thrive in an area, and by mixing the various types of scour protection material within the same wind farm, it may be possible to bring about all three new habitat types, and the animals and plants which they attract. There is also the potential for fin-fish species to benefit from the installation of turbine structures, with any of the associated scour protection materials deployed. As discussed above, the newly-created habitat will either attract in, or increase the productivity of, a wide range of species, including prey species for fin-fish. Increased productivity in the benthic community will, over time, enhance productivity all the way up the food chain, to the larger fish species, and potentially even marine mammals. A further aspect of the habitat-creation benefits of offshore wind farms which must be considered is the deliberate targeting of scour protection and the materials deployed to directly benefit specific populations. On a simple level, this may involve using boulder protection in an area where there is an established lobster or crab fishery, in order to provide additional habitat, and improve productivity, as demonstrated by Linanane et al. (2000). By making deliberate attempts to increase the number of juveniles settling in an area, and ensuring the correct habitat type is available for adult lobsters, this has the relatively rare effect of encouraging both ecological and commercial benefits, in addition to the environmental gains of the renewable energy generated from the wind farm itself. Taking this further, there are a number of specially-designed materials which could be easily adapted to be suitable for scour protection. One such example is the reef ball, designed and marketed by the Reef Ball Foundation, a non-profit environmental NonGovernmental Organisation (NGO), based in America. These structures come in a range of styles and sizes, designed to suit varying types of environment and seabed community. 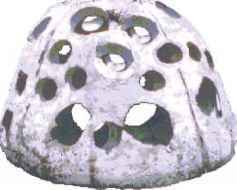 In general though, they are concrete domes, with a number of holes drilled into them at various levels and of various sizes, to provide a range of habitats for different species groups to utilise. Figure 3 shows the standard reef ball design. More complex designs, such as the 'layer cake' and 'stalactite' designs, are each designed with specific purposes in mind, from attempts to rehabilitate dead areas of coral reef to creating a surface on which to grow shellfish commercially. Fig. 3. The standard reef ball design (from the Reef Ball Foundation, www.reefball.org). Through a combination of specifically-designed materials, and the placing of such materials in environments in which commercial populations of certain species such as lobster exist, a situation beneficial to both the local environment and local fishing communities may be reached. As the reef balls come in a range of sizes, including that similar to the boulders installed where required around offshore wind turbines, they should be relatively easy to adapt to ensure they also fit the purpose of reducing scour around the base of the turbines, thereby also satisfying the key engineering purpose for which scour protection is deployed. However, as with any development, economics is a major factor in the design, planning and construction of offshore wind farms. With projects already costing millions of pounds to get into the water, additional costs for items such as the Reef Balls, when standard gravel or boulders are equally effective for the primary need, may not be easily approved by developers. However, there may be a mid-point to the discussions, if a material was identified which was relatively cheap to purchase and install (compared to the specially-designed Reef Balls), as well as being able to function equally well as scour protection and increased habitat around the base of the turbine towers. Materials commonly used in sea-wall construction, such as dolos blocks, tetrapods or concrete jacks, are built for strength, able to withstand large amounts of pressure, and also have unique shapes which lock in to each other, gradually shifting in the weeks after installation to form tight bonds with adjacent blocks. Using these materials would allow the creation of a wide number of niches, and increased surface area compared to boulders of a comparable size, thereby allowing greater potential for colonisation. Another key element in the potential habitat creation by offshore wind farms and their associated infrastructure / scour protection is the argument that these areas may become unofficial marine protected areas (MPAs). Although fishing activity is not directly banned within the boundaries of many offshore wind farms, and in many is taking place successfully, some fishing gear is not conducive to the environment within the site boundary, such as dredging, which could lead to entanglement in the inter-array cables associated with the turbines. It is therefore possible that some offshore wind farm sites may have low levels of fishing taking place within them. Fayram and de Risi (2007) suggest that by creating an MPA in the area surrounding offshore wind farms, with limited entry to fishing activity (both commercial and recreational), it may be possible to provide circumstances which would be beneficial to a number of parties. It is noted that in some cases, oil platforms have acted as de facto MPAs due to prevailing currents and the platform themselves preventing the use of several types of fishing gear. If the same is true for offshore wind farms, then the wind farm owners would benefit due to reduced risk of damage from passing vessels, fishing groups could benefit from locally enhanced stocks, and the benthic and fish communities could benefit from reduced disturbance from fishing activity. Therefore, although the main aims of offshore wind power generation and MPA designation vary considerably, in some situations they may be complimentary (Fayram and de Risi, 2007). Through the installation of offshore wind turbines, one of the key changes for the surrounding marine environment is the introduction of a new dimension in habitat terms. Many of the areas into which offshore energy generation is expanding is, for ease of construction, relatively flat seabed, with very few vertical elements such as reefs or cliffs. Therefore, the addition of the turbines and their foundations can add vertical habitat where before there only existed horizontal habitat for species to colonise. Although it is impossible to physically increase the volume of water column already existing as habitat, and it could be argued that the installation of turbine towers actually removes a negligible amount of water in the area, the installation alters the form of the water column habitat available. Despite turbines being up to almost 1km apart in some larger developments, the addition of the vertical habitat can act as shelter for some fish species, creating structure in an otherwise featureless open ocean. Therefore, an increase in the ecological 'usefulness' of the area is brought about, and as a result, its carrying capacity. This distance between individual turbines will also determine whether, from a community perspective, the turbines are independent of each other, or are able to act as one large area of introduced habitat. This varies between species, with 1km being well within the range of larger, motile species such as cod, lobster and some crab species (Linley et al, 2007), but for smaller fish species, or benthic organisms, which develop where they settle, there is less likely to be mixing between turbines. Although the design of the turbine layout is heavily based on economics, to ensure maximum wind, and therefore energy yield, consideration of the biological perspective in the array design at an early stage, could increase the potential for habitat creation to be as effective as possible.